Michael Franti on one of his excursions into the audience Monday night. Michael Franti's relentless positivity is an almost supernatural force, powerful enough to turn even the most cynical heart a little softer. And attending one of his shows with his band Spearhead, as nearly 1,500 folks did Monday night at the Knitting Factory, is the best way to encounter that positivity in its natural environs. Anger and aggression are well-tested fuels for excellent rock 'n' roll, but Franti's blend of reggae, pop, rock and hip-hop is utterly devoid of those emotions. That can make the man's lyrics a bit one-note, but only the most ill-tempered, downtrodden soul can attend a Franti show and feel anything but good vibes. The man exudes them, and his fans absorb them and throw them right back at the lanky, dreadlocked frontman. You might not walk away from the show swearing off shoes in homage to the perpetually barefoot Franti, but you'll walk away having taken part in a communal experience that is pretty unique in live music. For people who have seen Franti multiple times, that experience remains powerful, even if some of what Franti and Co. delivers is a bit familiar after so many years on the road. The excellent musicianship of Franti's band — bassist Carl Young, drummer Manas Itiene, guitarist J Bowman and keyboardist Mike Blankenship — provides the singer/guitarist with a bedrock base from which to go off in myriad directions, both musically and physically. While the band is locking it down on stage, Franti and his wireless microphone travel to all points of a given venue, reaching out to the crowd literally and figuratively several times over the course of the show. 1. Michael Franti wants you to jump! The guy is an athletic yoga advocate with the ability to bounce while he plays guitar and sings, and he's not going to let the audience get away with standing around and staring as if they're at some sullen indie-rock show. During his first song Monday, "Hey Hey Hey," Franti was quickly exhorting the masses, "I want to see you jump!" For the most part, the crowd happily complied. 2. 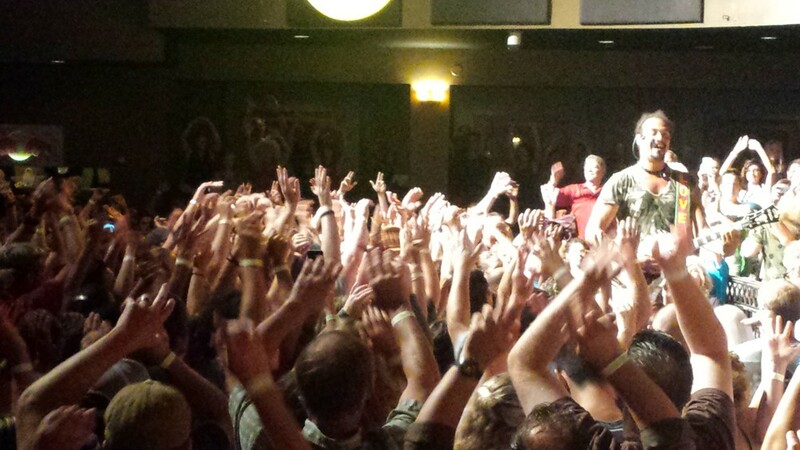 Michael Franti wants you to wave your hands in the air! Inspired by his days rapping with Disposable Heroes of HipHoprisy and Beatnigs, Franti likes his crowds to wave their hands in the air (yes, as if they don't even care). Again, right from the first song, he had the floor of the Knitting Factory turned into a see of waving limbs. 3. Michael Franti wants to get up close and personal! Just 15 minutes into the show, during "All I Want Is You," Franti was off and running into the audience, surrounding himself with loving, dancing fans while he sang. It was a move he would repeat often during the show, even heading to the upper reaches of the VIP section. 4. Michael Franti wants to be outside! 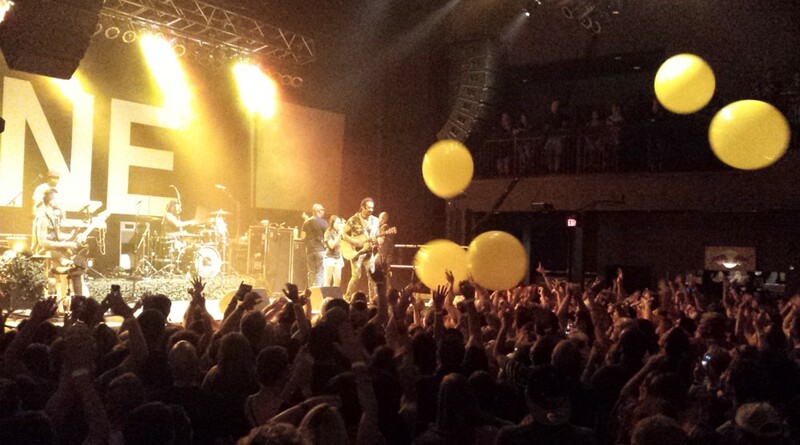 At least, thanks to the feeling one gets when his road crew unleashes a barrage of yellow balloons and beach balls on the crowd during "The Sound of Sunshine." He also had a 10 or 11-year-old girl join him on stage to sing the tune, an ingratiating move for sure. 5. Michael Franti wants to hear you sing! Franti knows that audience engagement takes more than soulful or hilarious between-song banter and goading the audience to jump, wave or clap. So, he encourages the masses to serve as a backup choir to his sunny sermons, doing call-and-response sections to many songs. On Monday, even the new and unfamiliar tune that started out with the line "My favorite wine is tequila" got the crowd crooning before it was halfway done. Throughout the show, the crowd was totally into it, dancing hard and reacting to his every command. When Franti slowed it down for a ballad or a short speech about the lessons of the Charleston shootings, the audience stayed with him. And when the man wanted to place to go crazy, they were right there with him for that, too. "So this is Monday night in Spokane," Franti mused after a few frenzied songs, including "Let It Go," "Love Will Find a Way" and "11:59." As a Monday night in Spokane, it was far from typical. But it reflected the man on stage perfectly.